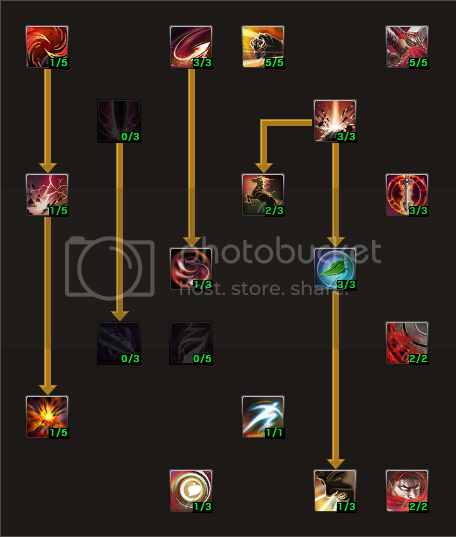 I use 2 Sturdy Chain for crit and 3 Plate set parts from cata with dif agility+str. I got about 44% Crit Chance ! and about 450-700 DMG. I do pretty good and pve and pvp ! defensive is not too great but you can get by with what i have. I would suggest to not get more than 2 on Furious dash (horse icon). And you might want to get the tornado and upward strike because they are really helpful. Other than that I don't have anything to discuss about since it's your build that you linked. Remember that you can get more dmg if you plan on going STR builds but use the crit buffs from your skills. mate if they add Lv 40 sometime and i will reset my build, what would you improve to same build for lv 40 ? because i like this crit build you made, fits my style. I'm not really sure as I'm looking more into PvE builds. So for that I would say max out Dodge attack to reduce cooldown, tranquility for more stamina restore + lower cooldown + heal increase during outrage effect. If you didn't understand what I meant earlier then I would say get atleast lv 1 upward strike and tornado for more combos.